Last night we had just finished up dinner, when we began to hear a splashing noise around the boat. It sounded very similar to what we had heard in Mud Hole. I decided that I wasn’t going to let all the fish get away this time and I turned on our bright decklights and headed topsides to set up the fishing pole. I saw a small school of “fish” go by and I cast my line in their direction. They weren’t interested. Very soon though the boat was being swarmed. 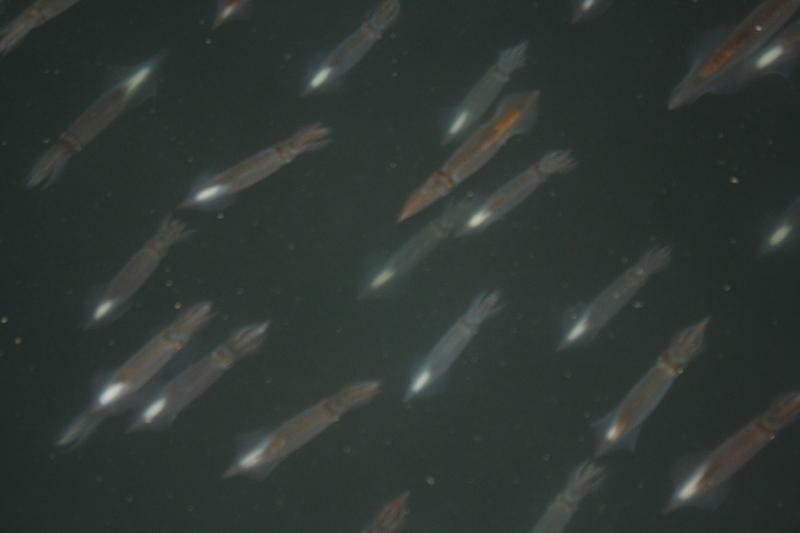 It took me a moment to identify what they were because they were not moving like fish… we were surrounded by squid. 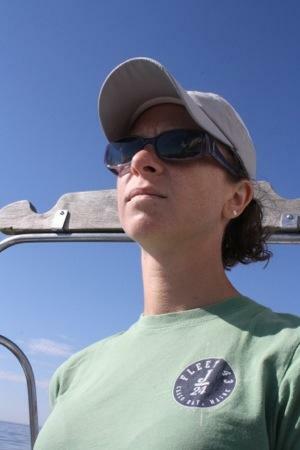 Stephanie came up to take a look and more and more squid kept appearing until they were on all sides of the boat. I spent some time trying to get them to grab on to any of the lures in my tackle box so that we could enjoy some calamari, but no luck. I also couldn’t catch one in a bucket although I think I was close. Just one more reason for us to get our hands on a casting net in the near future. After watching the squid swarm the boat for about 45 minutes we started to head back inside. Just before going into the hatch we heard a loud noise just outside the circle of light cast by our deck lights. First we heard a large spashing noise, followed by what sounded like loud labored breathing. This stopped us in our tracks and we stood in the cockpit listening to what could only be a sea monster just outside the range of our lights. Soon we could hear the labored breathing coming from 3-4 directions all around the boat as well as much more regular splashing. 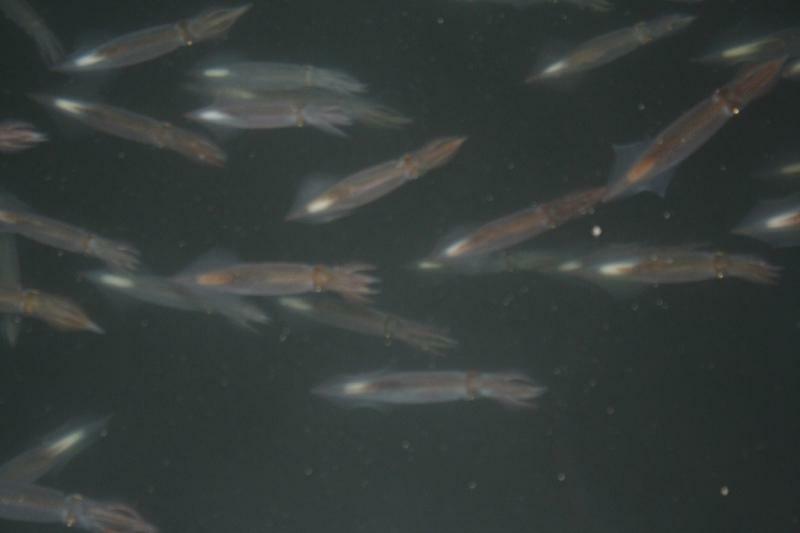 This entire time the squid are still swimming around and around the boat. All of a sudden the squid scattered and we saw a grey shape come cutting through the water, stopping just off the side of our boat heading back out into the darkness. 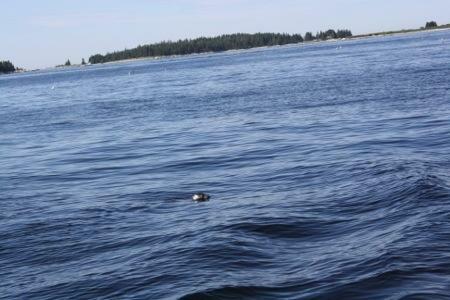 It didn’t take long before we started seeing more and more grey shapes in the water, the seals had found the squid. Our attracting the squid to our lights allowed the seals to have quite the feast! 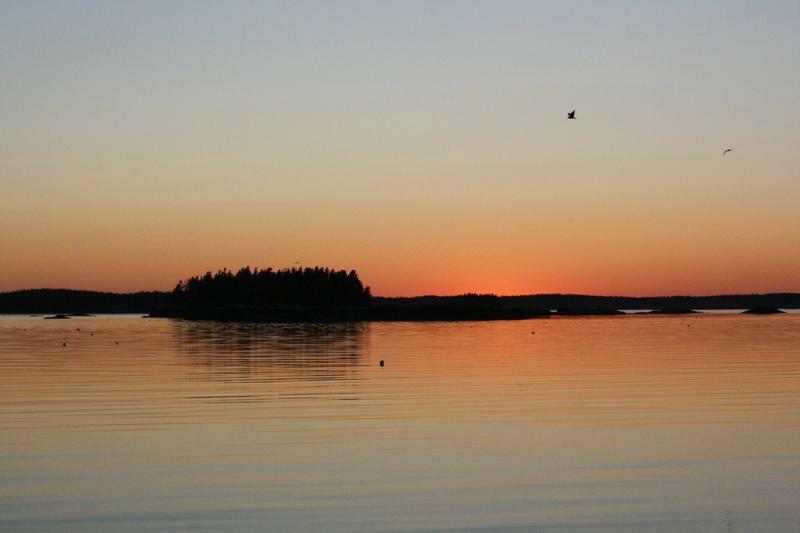 We had a great sail out of Southwest Harbor, and as we passed the Cranberry Islands we decided to turn left and so we headed downeast. 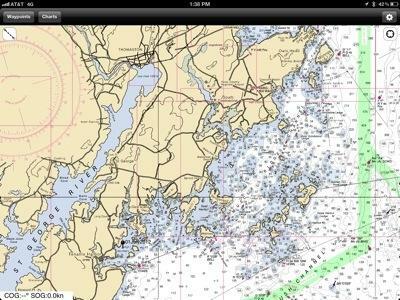 We set our sights on the end of Schoodic Point and took out the trusty cruising guide to find out what we could expect. According to the guides we should expect rugged wild areas where we could imagine that we were at the end of the world. We decided that the end of the world sounded quite desolate, and promptly called our mothers to tell them not to worry if they didn’t hear from us for the next several days. 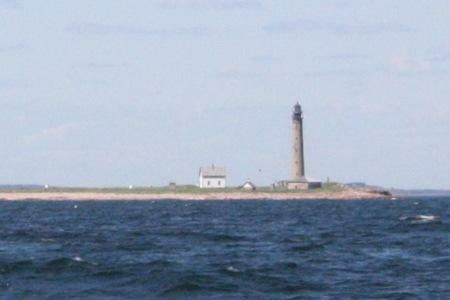 The wind was coming out of the west, so we had a great downwind sail past the Petit Manan lighthouse. This area is highly prone to fog, but we had fantastic visibility as we sailed past. 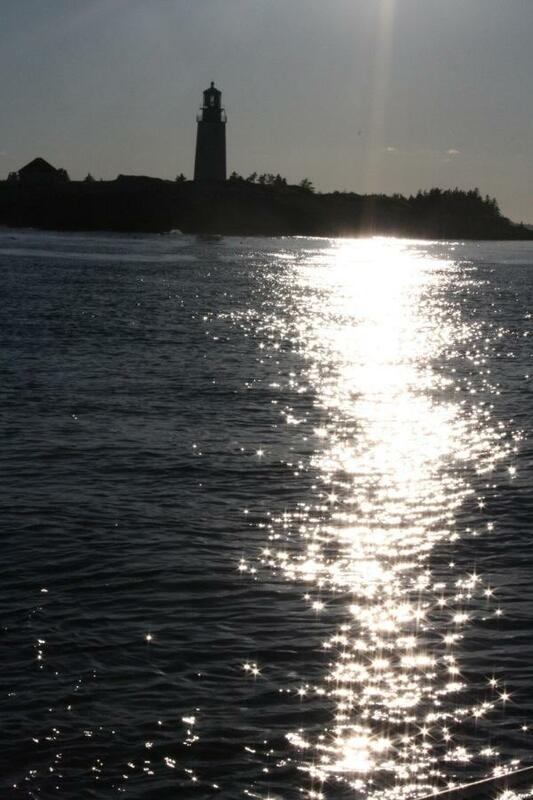 The sun was starting to get low as we motored through Main Channel Way and cast the lighthouse as a silhouette against the rugged Maine horizon. 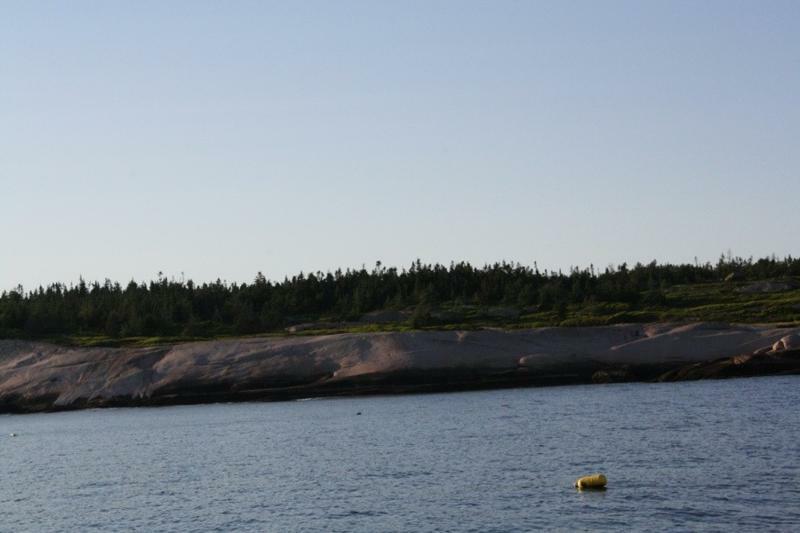 The geology looked a little different and the rocks much more worn as we headed into our harbor. 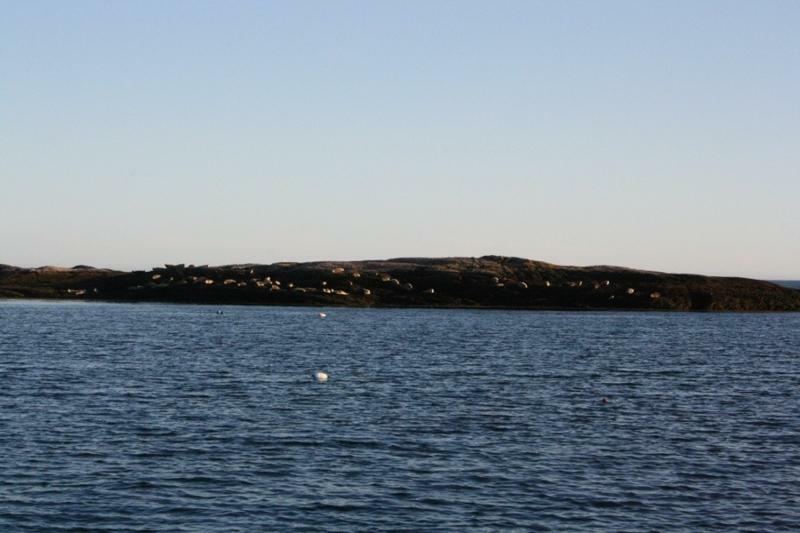 One of the rocks/little islands that formed the western side of our harbor was home to entire seal colony. 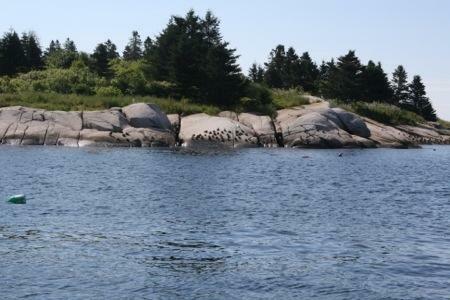 We counted at least 36 seals all on one rock! We got our anchor set quickly as the sun began turning the sky to a beautiful pink color. 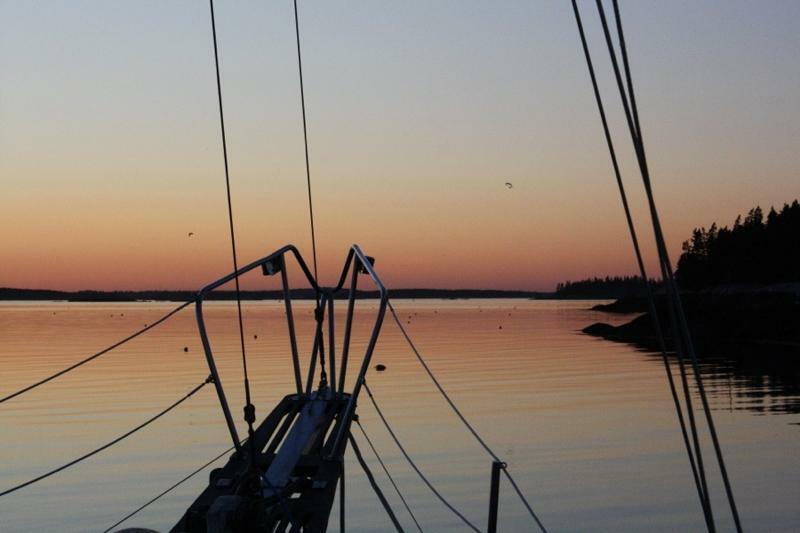 Motor, sail, motor, sail, motor…..it was a long day of motoring and sailing through Penobscot Bay. 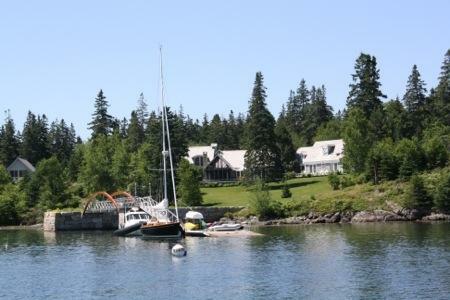 We left Tenants Harbor bright and early; by 7:30 we had finished our morning routine and hauled up the anchor. I feel like a Planet Fitness ad as well after hauling the 45lb anchor up along with 90lbs of chain. 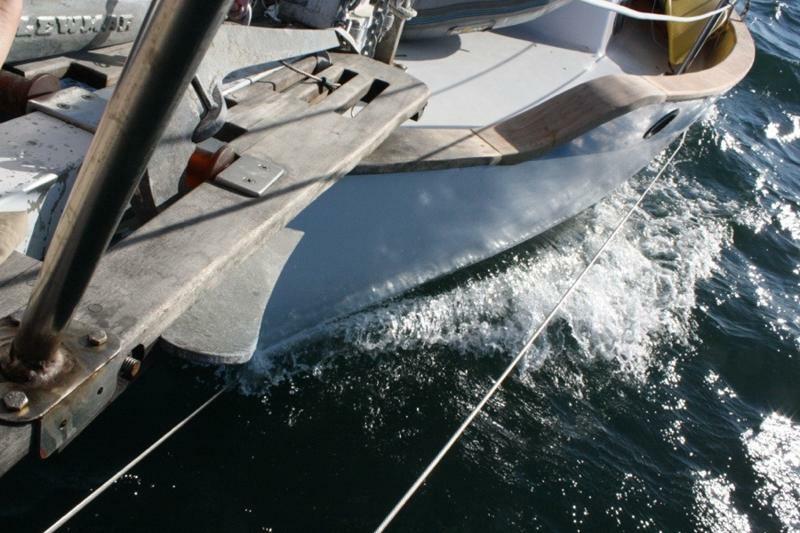 The lack of wind had us start through the Muscle Ridge Channel under diesel power. 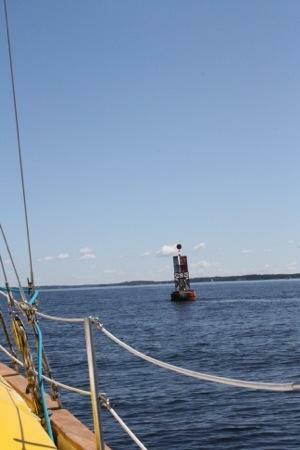 We navigated channel marker to channel marker through our first of four channels for the day. Serious navigation required! 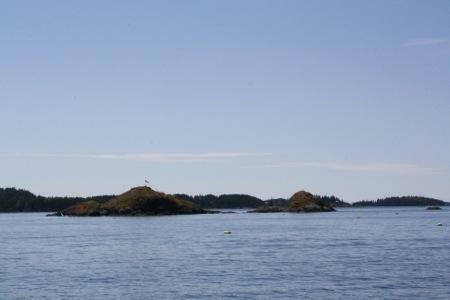 It kept the sights interesting as there were rocks and islands on all sides as well as minefields of lobster buoys. 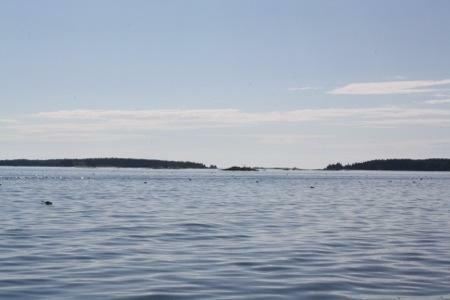 Lobster boats were working throughout the channel and off to the sides where our charts clearly showed rocks… We had our first sightings for the day of seals and dolphins. After successfully clearing the Muscle Ridge Channel, we had some open water before the Fox Island Thoroughfare. 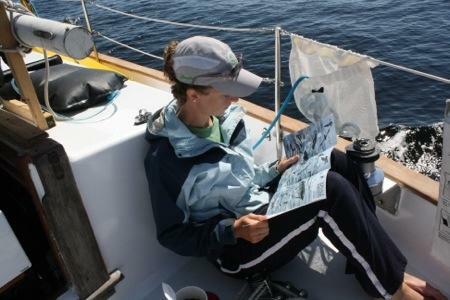 Stephanie took advantage of the easier sailing to read up on the sea life that we were seeing. We think that the dolphins that we have been seeing are actually harbor porpoises. 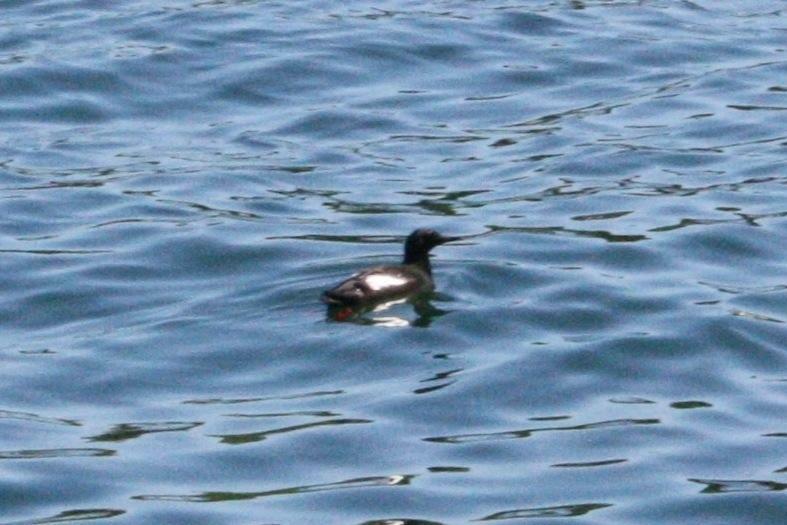 We also tried to identify some birds, but were having some trouble with this one. Perhaps one of our bird watching readers can help us out. 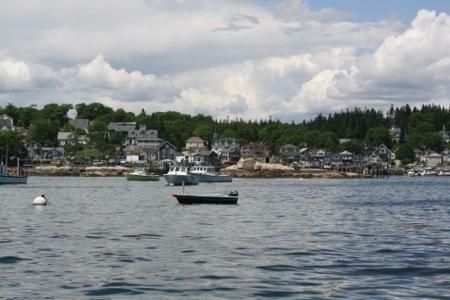 The Fox Island Thoroughfare runs between North Haven and Vinylhaven Islands. The entrance was marked by this channel marker, with the letters “FT” on it for Fox Thoroughfare. Stephanie picked out another future summer home. I think that she is trying to appeal to how much I like boats, this house seems to have a boat for every occasion. 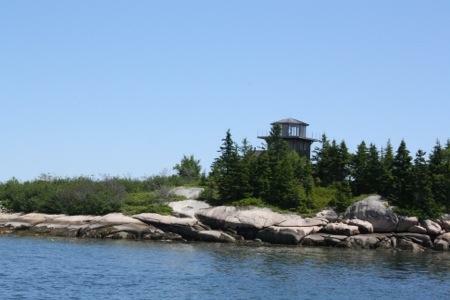 Some other significant landmarks inside the thoroughfare included the Fox Ears islands partway through and the Goose Rocks lighthouse at the exit. Upon exiting the throroughfare we had enough wind to sail…or so I thought. Stephanie thought that we needed more. 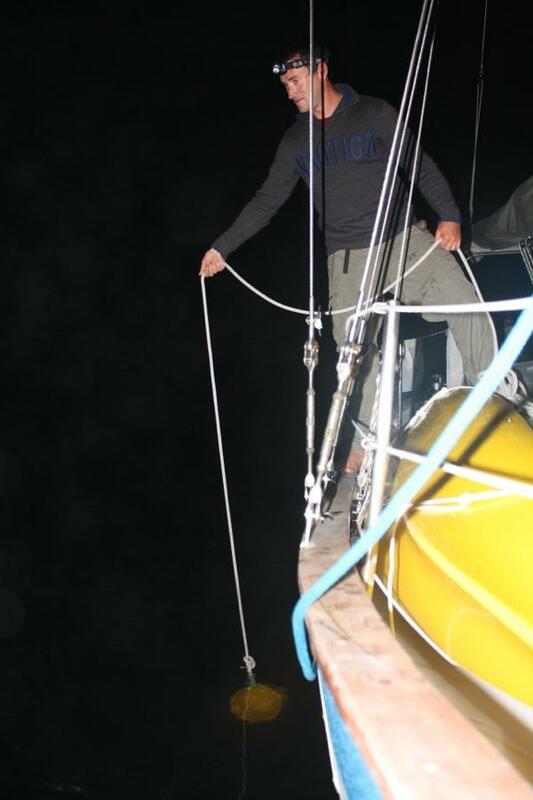 We put up the sails and slowed…way…down. Most of our speed ended up being due to current, which was going sideways. 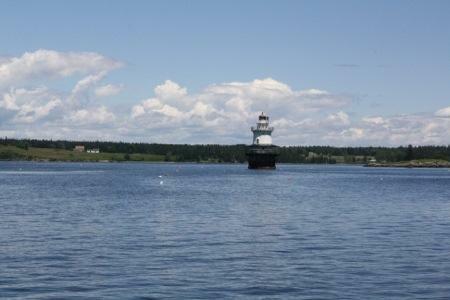 After about 45 minutes, we couldn’t keep the sails full any longer so we restarted the motor and headed through the Deer Isle Thoroughfare. 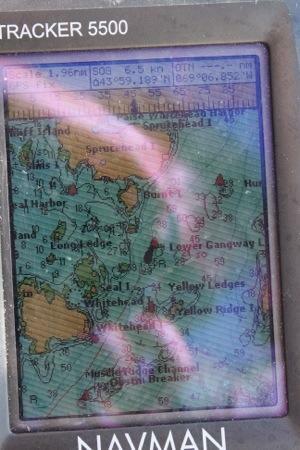 This passage was a little different, it was clearly a working passage, and the lobster boats were commuting home. There was a lot of traffic! 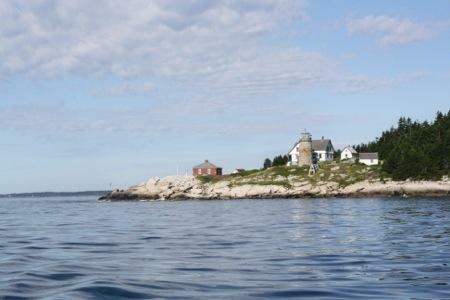 We passed the Crotch Island lighthouse (we can’t make this up) just before passing the town of Stonington. 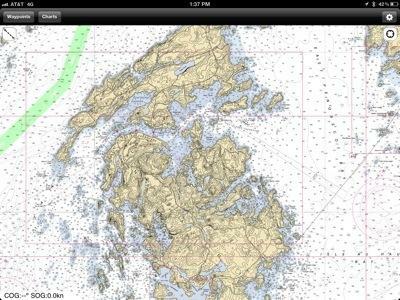 As we exited the Deer Isle Thoroughfare, the wind built in for real this time and we set the sails. 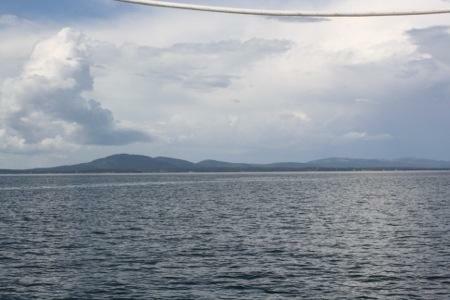 We cruised quickly in the direction of the Casco Passage, and caught our first glimpse of Mount Desert Island. 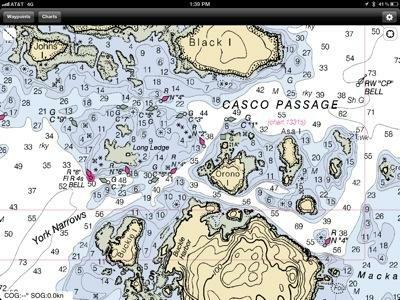 We sailed through the Casco Passage, and on to Southwest Harbor. 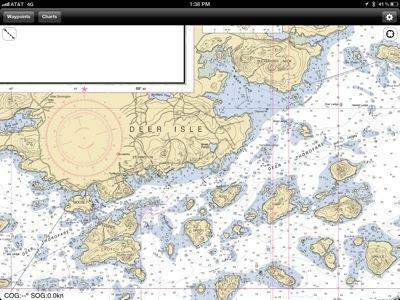 We scouted out a potential anchorage near Southwest Harbor, but couldn’t identify a good place to go ashore. We headed to the inner harbor and picked up a guest mooring for the night. Ryan and Jocelyn picked us up at the dinghy dock and drove us to Bar Harbor for dinner. Food and drinks at the Finback Alehouse were delicious. The night passed quickly as we caught up with our friends. We played a game of cocktail roulette for our last round while listening to live music. Mmm…gin fizz!